These candlesticks are carved in a variety of materials. 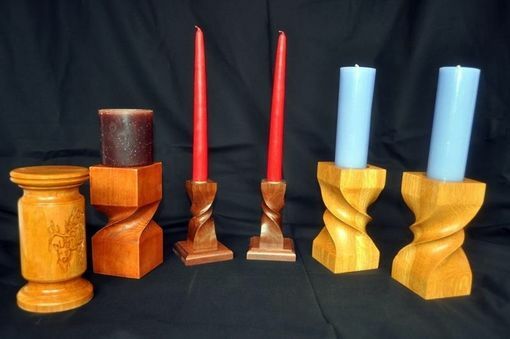 The items in this picture, from left to right, include a turned and carved cherry candle stand, a twist made from poplar, a pair of taper candlesticks with our distinctive twist in walnut, and a larger pair of twist candlesticks in white oak. These can be used in a number of settings. The twist candlesticks fit in particularly well in modern decor.